We are reminded every day by homeless shelters that hundreds of thousands of pets need homes. But there are some who already have homes on the streets and in shelters with their owners, who are homeless. Among the 3.5 million Americans estimated to be homeless, about 260,000 have pets who, besides the love and attention their owners give them, need food and veterinary care. 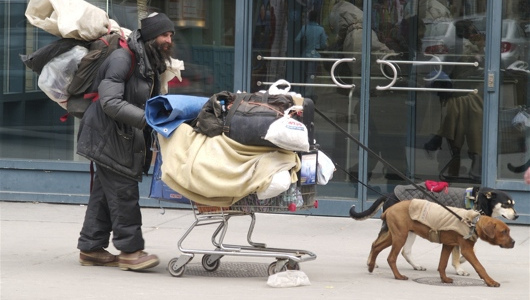 Pets of the Homeless, a non-profit volunteer organization, exists to take care of those needs. Throughout the country, Pets of the Homeless collect pet food, clean bowls, and other pets supplies as well as cash donations. The donations are shared with homeless pet owners through hundreds of collection sites throughout the U.S. The organization also funds licensed veterinarians to provide necessary medical care and preventive medicine, such as vaccinations, to the pets. Pet lovers are pretty sympathetic people, by and large, especially to animals. Pets of the Homeless is a perfect avenue to express the sympathy and support we all have for pets in need. Donations are tax deductible and you can even make them in honor of your own pet. To learn more about this worthy charity, visit Pets of the Homeless.